Welcome! The lobby of the Deranged L.A. Crimes theater is open. Grab a bucket of popcorn, some Milk Duds and a Coke and find a seat. 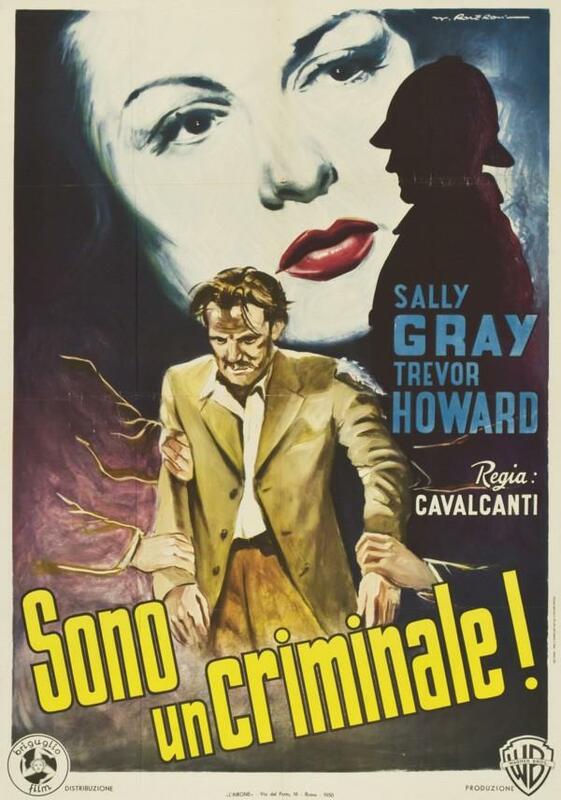 Tonight’s feature is THEY MADE ME A FUGITIVE (aka THEY MADE ME A CRIMINAL) starring Sally Gray and Trevor Howard. Narcy, the mastermind of a black market operation run out of the Valhalla Undertakers in London, informs his confederates, Soapy, Bert, Curley, Aggy and Jim, that Clem Morgan, a former soldier, will join their organization. Later, Narcy meets Clem at a bar and is immediately attracted to Clem’s girl friend, Ellen. The following day, when Clem arrives at Valhalla, he is stunned to find Ellen in Narcy’s office. Then, when Clem discovers drugs mixed in a shipment of nylons, he tries to renege on his arrangement with Narcy, who explains that this was a one-time favor for another criminal. Privately, Clem tells Ellen that he intends to pull out after the next job. That night, Narcy, who distrusts Clem, frames him with Soapy’s help, for the hit-and-run murder of a policeman, and Clem is sentenced to fifteen years in prison. Welcome! The lobby of the Deranged L.A. Crimes theater is open. Grab a bucket of popcorn, some Milk Duds and a Coke and find a seat. 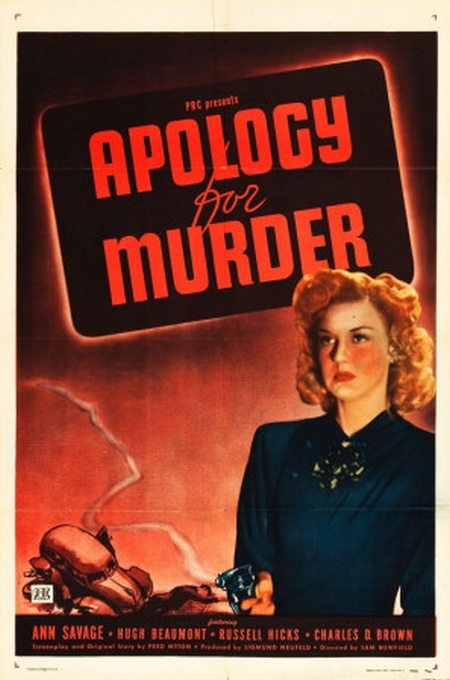 Tonight’s feature is APOLOGY FOR MURDER starring Ann Savage, Hugh Beaumont, Russell Hicks and Charles D. Brown. Reporter Kenny Blake (Hugh Beaumont) falls in love with scheming Toni Kirkland (Ann Savage) not knowing that she is married to a man years older than she. By the time he finds out, he is so under her spell that he murders her husband which is what Toni had planned all along. City editor McKee (Charles D. Brown), Kenny’s boss and best friend, begins to pursue the tangled threads of the crime relentlessly and gradually closes the net on Kenny. The latter is mortally wounded by Toni, who has deserted him for another man. Welcome! The lobby of the Deranged L.A. Crimes theater is open. Grab a bucket of popcorn, some Milk Duds and a Coke and find a seat. 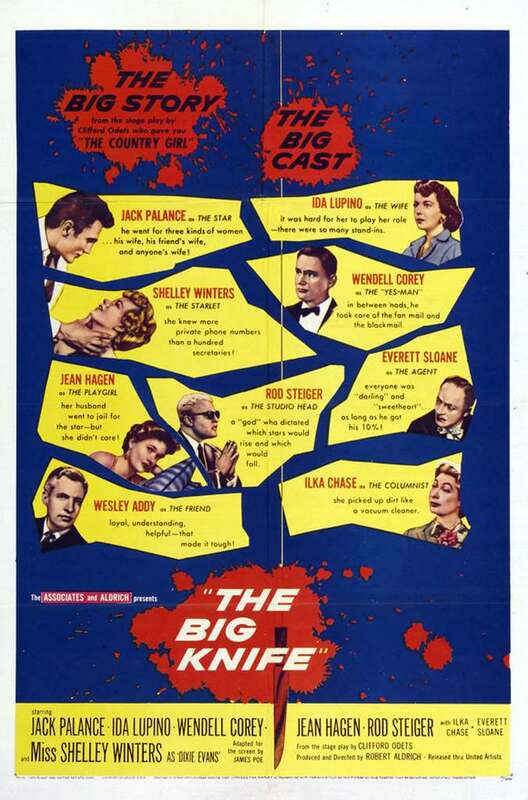 Tonight’s feature is THE BIG KNIFE starring Ida Lupino, Jack Palance, Wendell Corey, Jean Hagen, Rod Steiger and Shelley Winters.